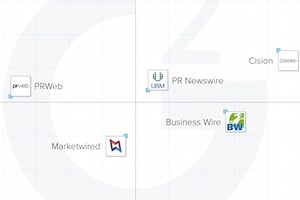 Which press release distribution services are most used and liked by businesses? To find out, G2 Crowd recently examined more than 380 evaluations, written by PR professionals and marketers, of press release services. The researchers then ranked the six most popular services (those with 10 or more reviews on the G2 Crowd site). 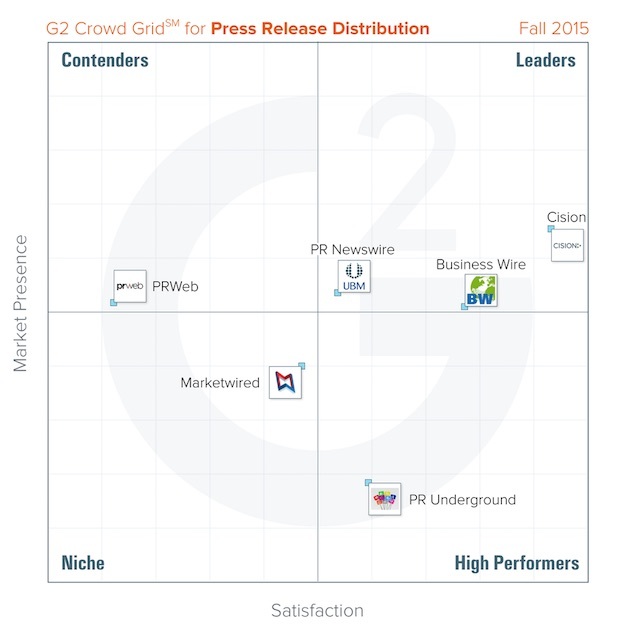 “PR distribution services” were defined in the report as “platforms that expose and send press releases to various media sources on the web.” G2 Crowd ranked the tools based on customer satisfaction scores and the size of their market presence. Overall, 86% of reviewers say the press release service they use meets their requirements, and 80% are likely to recommend the product they use. However, many reviewers specifically noted the large expense of press release distribution tools. Many reviewers also said they wish they could get a greater return on investment from these tools, especially by being able to target specific audiences. Cision, Business Wire, and PR Newswire were named Leaders in the report: They receive strong customer satisfaction scores and they also have a large market presence. PR Underground was named a High Performer: It gets high customer satisfaction scores but has a smaller market presence. Cision earned the highest overall satisfaction scores. Your Website’s URL: An Expensive .com Domain Name… or These Creative Alternatives?